Royal Caribbean’s Allure of the Seas has more than enough dining venues on board to keep any passenger very well fed throughout their cruise. 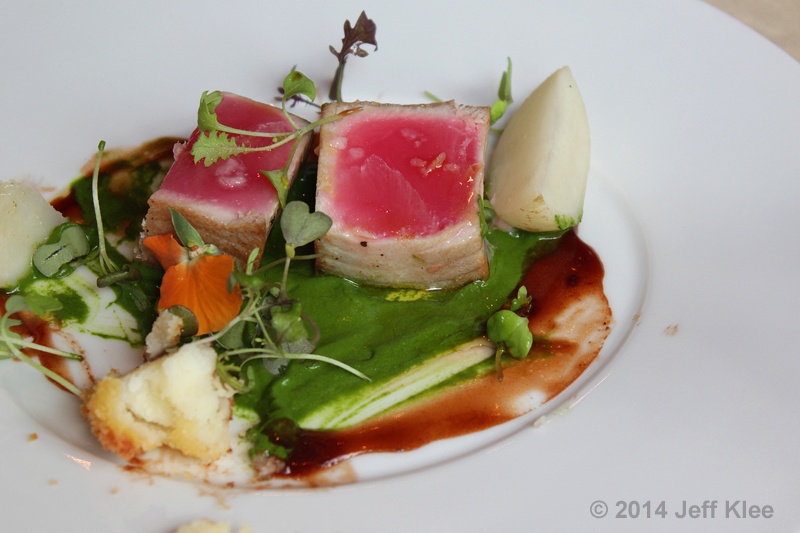 I recently reviewed their highest level fine dining restaurant, Chef’s Table. But what if Chef’s Table’s limited availability has made it impossible for you to snag a reservation? What if you want a more intimate fine dining experience with your significant other, without fourteen other strangers at the the table? Or what if you just don’t want to drop another $170 per couple on a dinner when there are cheaper options, including numerous free venues across the ship? Assuming you still want that fine dining experience, but with just you and someone else (or several others if you have a group you want to dine with), there are plenty of options. The bridge between Chef’s Table with its tasting menu and Chef inspired dishes, and places like Giovanni’s Table and Chops Grille with their option filled menus, busier atmospheres, and slightly more common dishes, sits at one end of Central Park. You could say their address is 150 Central Park, as that is the name of the restaurant. Of course that isn’t actually an address. There are a couple versions of where the name originated. 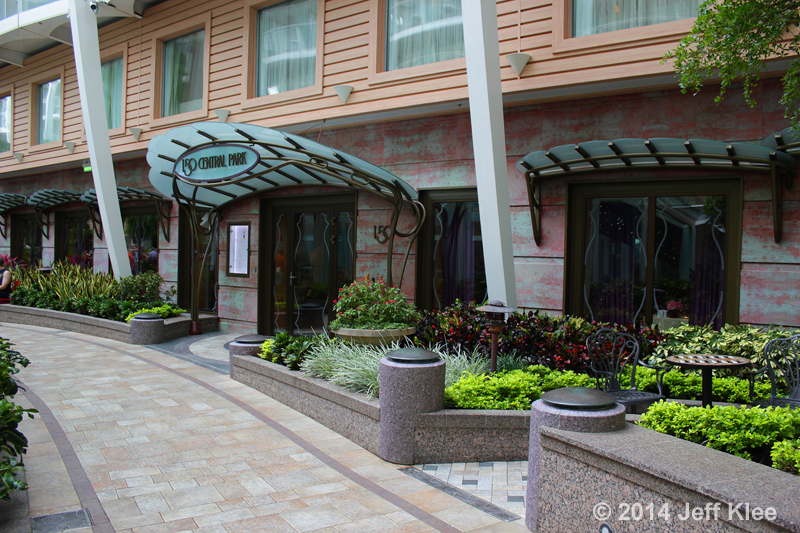 One is that when building the ship, this restaurant was the 150th block to be attached to the frame of the ship. The other version is that the restaurant actually sits in block number 150 (these “blocks” are the spaces where each modular unit is placed in the ship when it’s being built). Regardless of the name, 150 Central Park has earned its reputation as a proper fine dining meal that brings you the freshest ingredients from local Florida farms. It presents each set plate over six courses, and if you choose, can include wine pairings with each course at an additional cost. 150 Central Park sits at one end of the park. It does not have any outdoor seating as it wouldn’t be conducive to the flow of the dinner. Walking into the restaurant, you will find the host’s desk immediately to your right. Straight ahead is a table that, among three tall vases with decorative flowers, held a couple sales items along with some restaurant information. At the back of the table was a pamphlet that showed all the specialty restaurants on board. These pamphlets were found all over the ship, as they were promoting a new discount program that debuted the week of my cruise. When a passenger books at least 3 specialty meals, they receive 20% off all three. If 4 were booked, it would save them 25%, and 5 or more saves 30%. The table also held two sale items, one being a decanter style wine aerator, and the other was the current Royal Caribbean cookbook. I mentioned this cookbook in my Chef’s Table Review, as it came with the price of dinner. The last items on the table were the two menus for the week. 150 Central Park has one menu for the first half of the week (Sunday through Wednesday), and another for the second half (Thursday through Saturday). More detail on the menus will follow. To the right of this “informational” table is the all famous (to anyone who has dined at 150 in the past) cucumber martini preparation table. More detail to follow on this as well. 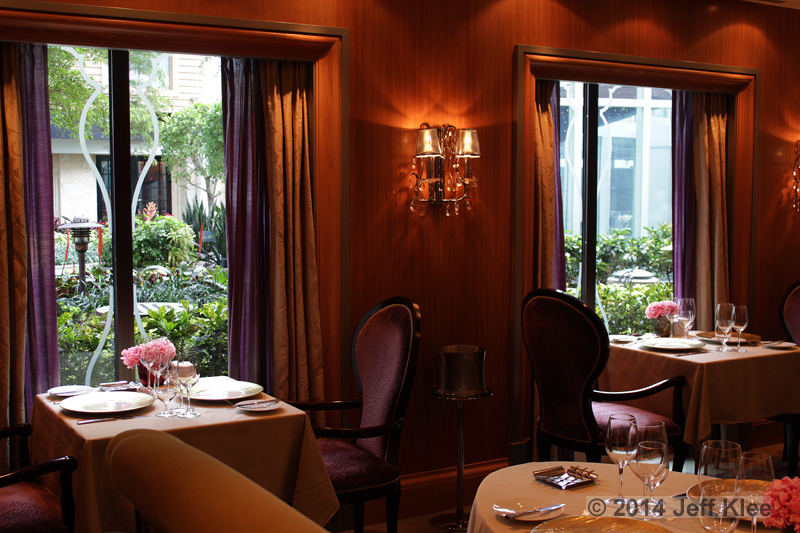 The dining room is elegant, with traditional décor tightly packed into the smaller venue’s available space. The first piece to attract your attention is the $500,000 hand laid, tile mural across the back wall. In the forefront is a table for ten. Although this table is closest to the entrance, taking away some of the private feel, it still has a more exclusive “chef’s table” feel with the mural as a background, and no other tables within earshot. Seating on either side of the entrance area is a mix of two-tops and tables for six or more. The ceiling has a slightly more modern look that matches today’s yachts. Ambient lighting keeps the room bright enough to see, but low enough to keep the fine dining ambiance. As the outside lighting dims, so do the interior lights. One side of the room has windows looking out onto the park, while the other has faux windows that are framed, edged with curtains, and have horizontal chandeliers for lighting. 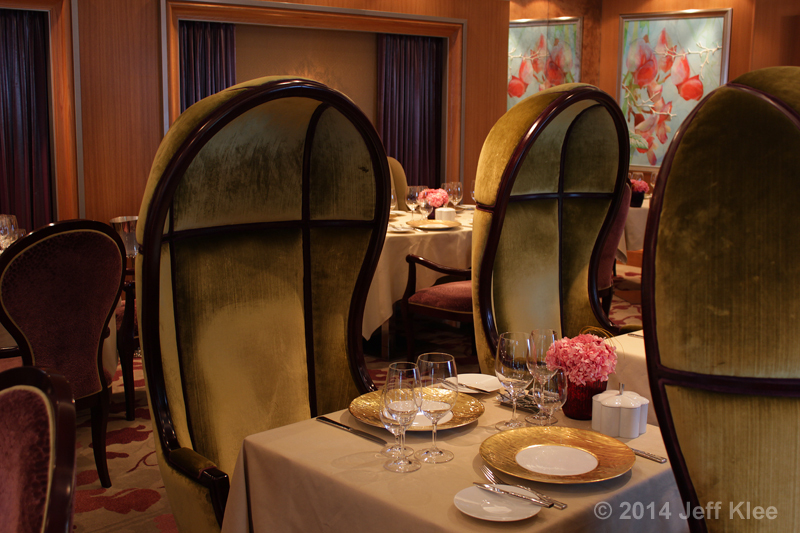 The tables for two that take up the central dining room floor are spaced closely. In order to keep the setting as intimate as possible, designers used an ingenious type of chair to close each couple off from the rest of the room. They have an over-sized clam shell shape that wraps around the person sitting in it. I sat at one of these tables during my last visit, and it’s amazing how the sound of one’s voice carries across the table to the person sitting with you, but other sounds from around the restaurant are muted. These seats also visually keep you secluded from other nearby tables. The fun part about sitting in these seats is that if you’re like me and you anticipate each course coming out, waiting to see the server walking towards your table with plates of food that you know are for you, that won’t happen here. The server many times would sneak up on us and suddenly be standing there placing a plate of fresh food in front of us. The element of surprise kept the anticipation higher, but allowed us to focus more on conversation rather than watching for the server walking up to our table. For our dinner during this most recent trip, we were seated at the very far end of the restaurant, at a window seat for two. This time we had our infant son with us and we had been concerned about bringing him to such a nice place for fear of disturbing other diners. We purposely booked the earliest reservation possible for the 6:00 hour when they first opened. Earlier in the day we stopped by the host’s desk and spoke with Oliver. He had actually been our server at 150 Central Park when we dined here on our first cruise exactly two years earlier. He had since been promoted to the restaurant host. He placed us at that table on purpose, and made sure that night to seat a larger party of eight or ten with a couple of children right next to us, ensuring that the people nearby wouldn’t be disturbed by a noisy child if it came to that. We appreciated the effort he put into make us feel comfortable about bringing an infant to dinner. In the end it all worked out as our son slept through the entire meal anyway. 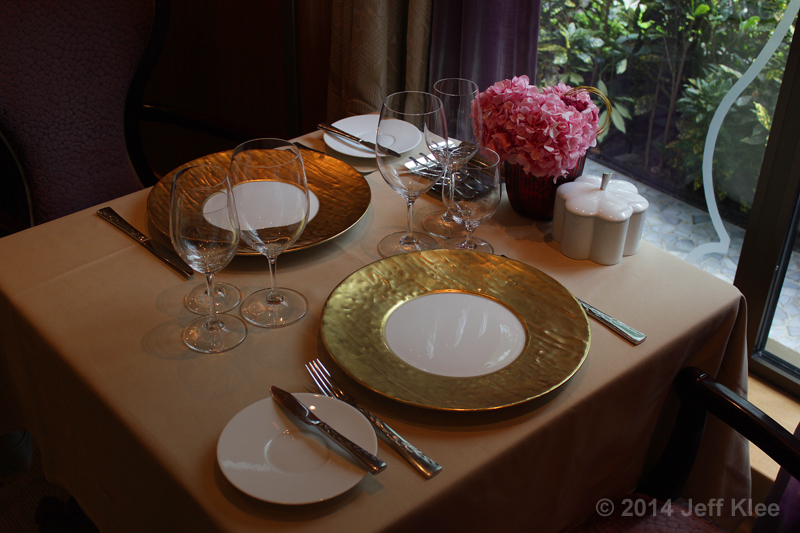 The tables are nicely set up, with large gold leaf dinner plates, bread plates, two wine glasses, and a water glass. The table also has a small vase with flowers matching those at the front entrance, and a flower shaped dish that holds in integral ingredient for one of the restaurant’s courses. My wife and I ate at 150 Central Park twice during the week, so we could experience both menus. This review is from the second dinner, but I will display the menu from the first night as well. The menus change often, as they use fresh, local (defined as Allure’s home port in Florida, since the restaurant technically moves from location to location with the ship) ingredients for every meal. 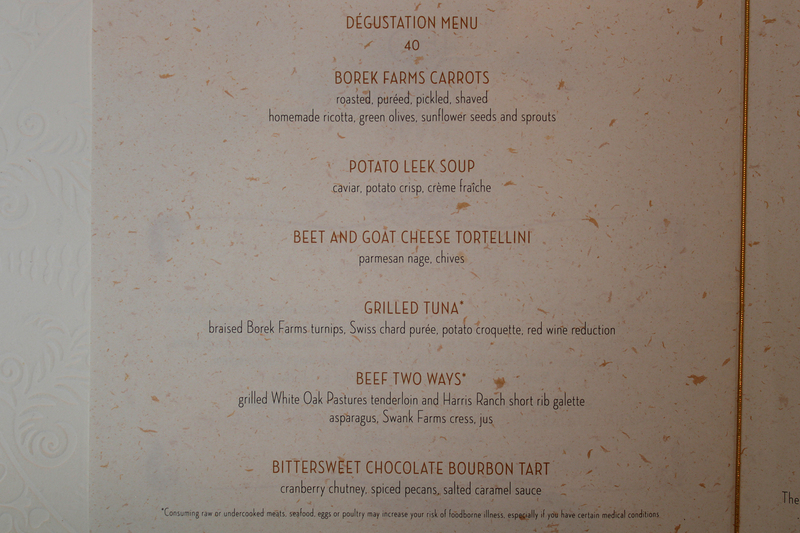 The menus are all a set, six course meals, preceded by a bread course for $40 per person. The menus can’t be altered for the sake of tastes, although as with all restaurants on board, if you have an allergy they will alter a dish to make it allergy free. On our last cruise two years ago, the main entrée course had a choice of two plates, but during this cruise both dinners were completely set for us, with no choice. 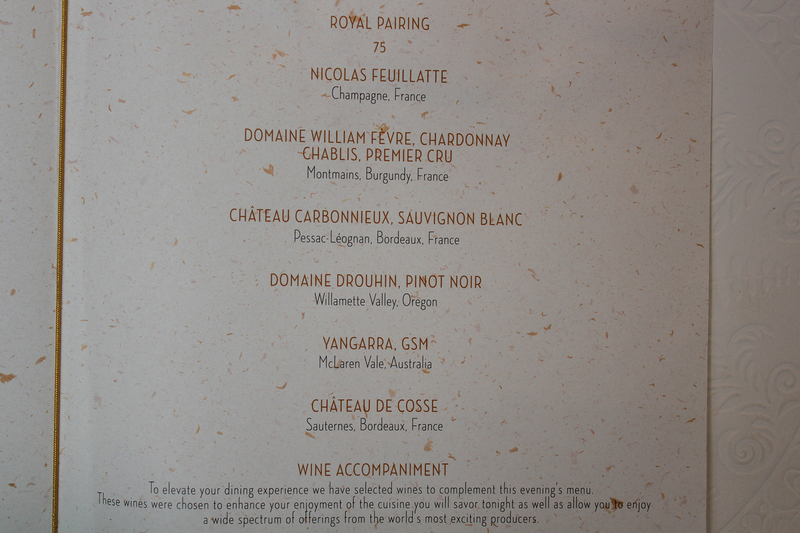 One choice you do have, is to add a wine pairing to each course for an additional fee of $75 per person. This essentially triples the price of your meal, but for those that really enjoy their wines, I’m sure the price is not a factor. At six glasses of wine, the price per glass is $12.50, which as always, includes tax and tip. Since we were enjoying our second meal of the week here, we weren’t focused on the bread course. Unfortunately, because of that, I neglected to take photos of this portion of the meal. It is actually a relatively unique part of the experience that the staff take pride in. I do have a photo of the bread from the earlier reviewed Chef’s Table meal, as as it happens, it’s the exact same bread served at 150. 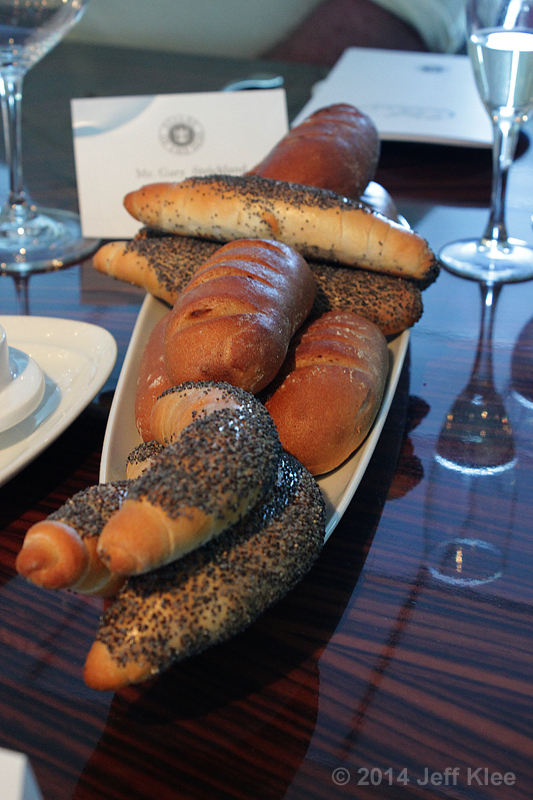 The reason the bread service is so special is because of it’s accompaniments. 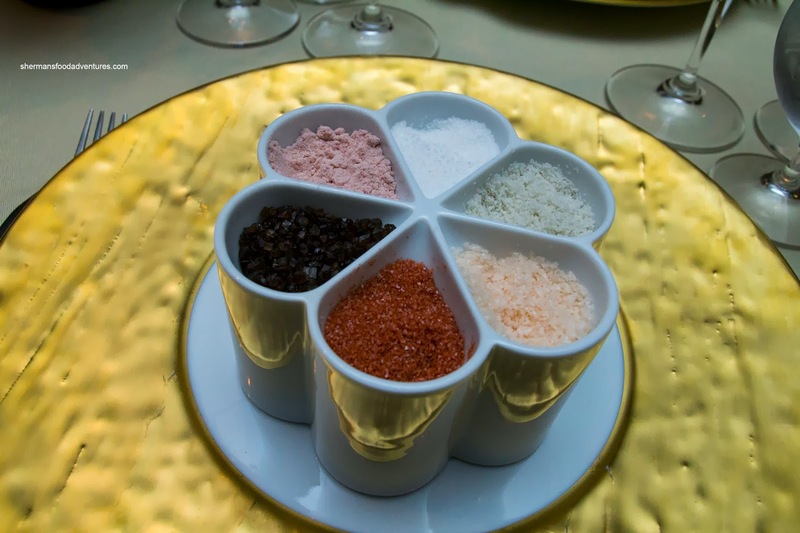 On the table sat a flower shaped container that held six different salts from different regions around the world. Each had its own unique flavor. One was Kala Namak, a black mineral salt from India. It tasted exactly like a hard boiled egg. Next was Alaea from Hawaii. This one contained lots of iron due to the volcanoes. It was described as muddy, earthy, and we were told it tasted like rose pedals. Then came Salish, from the state of Washington. It was a smoked Alder salt that had a very distinct smokey barbecue flavor. After that, Murray River, a citrus-y, crunchy, pink flake salt from Australia. The last two were Mediterranean sea salts from France. One was Sel Gris, a gray sea salt, the other, Sel de Mar. The butter is purposely left unsalted, so that you may play with the different flavored salts to your liking with each bite of bread. It’s an unusual, but fun (and knowledge inspiring) experience. The last order of business before getting our food was another well known (again, to cruisers of the Oasis class ships) special drink that can only be purchased at 150 Central Park. The Cucumber Martini. 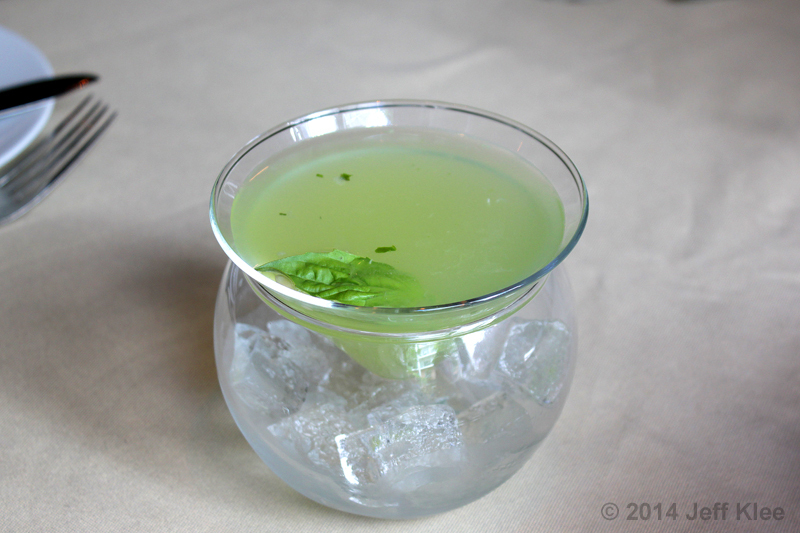 This drink is a mix of cucumber, basil, Monin® lemon grass syrup, sweet and sour mix, and Grey Goose Vodka®. It is served in the upper portion of a martini glass, that sits in a larger glass of ice, keeping it cold without watering it down. Many people have claimed that this signature martini is one of the best drinks they’ve tried. As someone who doesn’t drink, my first tasting of the martini two years ago found it to be a little too strong on the alcohol, which took away my enjoyment of the flavors. Those that enjoy their alcohol will like the strength of this martini along with most other drinks served on Royal Caribbean’s ships. This time however, I ordered mine sans alcohol. I don’t know what they used as a replacement, but it was an extremely delicious, sweet flavor that had a defined taste of cucumber and basil. I absolutely loved it this time. For my version of the normally $15 drink, I was only charged $7. Finally we got to the meal, or at least the first sixth of it. 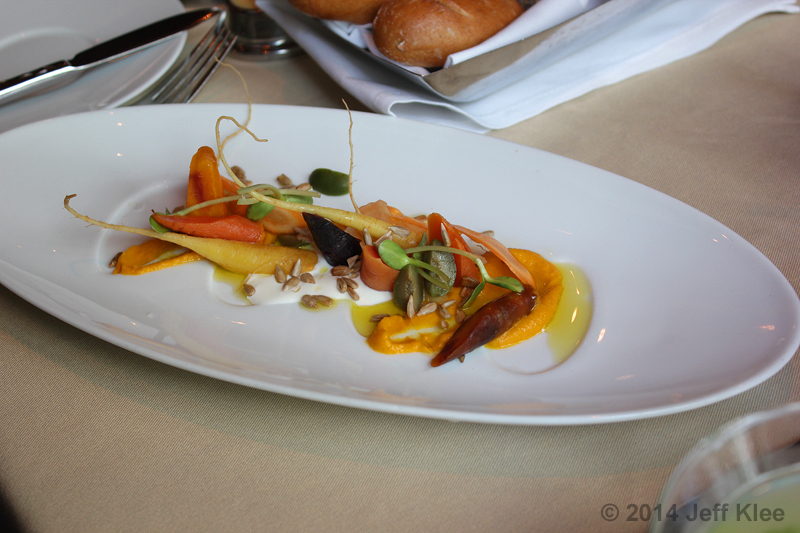 The six course meal began with Borek Farms carrots. It was a plate of carrots served in every fashion; roasted, puréed, pickled, and shaved. The plate also included their homemade ricotta, green olives, sunflower seeds, and sprouts. In most restaurants, if you were served a plate with nothing but carrots, you might be quick to complain to the server. In this case, the variety of preparation and style of each carrot made this an interesting dish. Tastes from sweet to sour and textures from soft to crunchy ranged the full gamut. Starting with soft and sweet, we had a purée of orange and yellow carrot in two dabs on either side of the plate. Not so sweet was the ricotta cheese in the middle, which was laying in a thin layer at the bottom of the plate. Getting a little firmer, we were introduced to both yellow and orange carrots that had been roasted until soft. The root’s ends were kept attached, allowing for a natural, fresh flavor. Firmer yet were the pickled carrots. These brought on the most bite from their flavor, but were calmed slightly if I managed to get a small wedge of green olive at the same time. The crunchiest texture came from both the shaved orange carrot that was kept in its raw form, and the sunflower seeds sprinkled around the plate. A couple sprouts for garnish rounded out the course. This was an interesting one for me. There were a lot of flavors that to me seemed random, even if they had a specific intention for being there. I enjoyed the tastes, but felt it made for a better side dish than an initial appetizer. This dish was almost identical in style to the one earlier in the week. The difference was this menu replaced beets with carrots, robiola cheese with ricotta, pistachios with sunflower seeds, and citrus with sprouts. 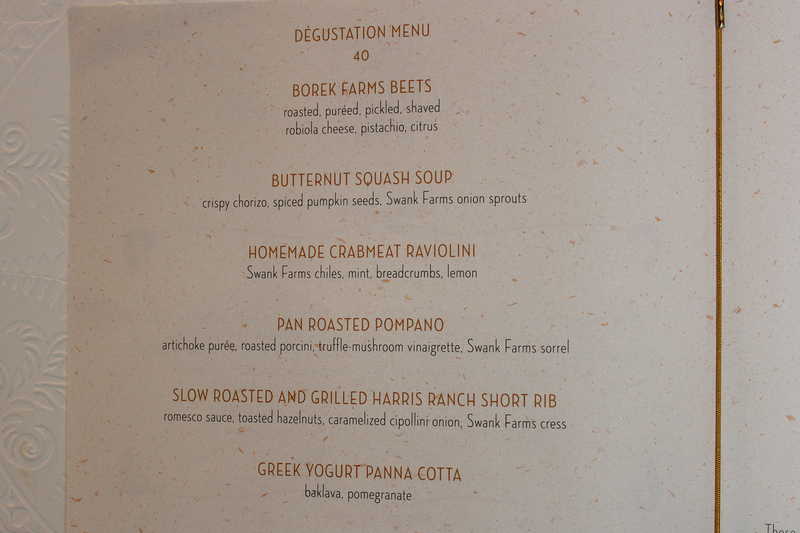 The beets in the original menu came from the same farm, and were served in the same fashion as the carrots later in the week. Next, we were served a potato leek soup. It was blended with crème fraîche for a thick, creamy texture. 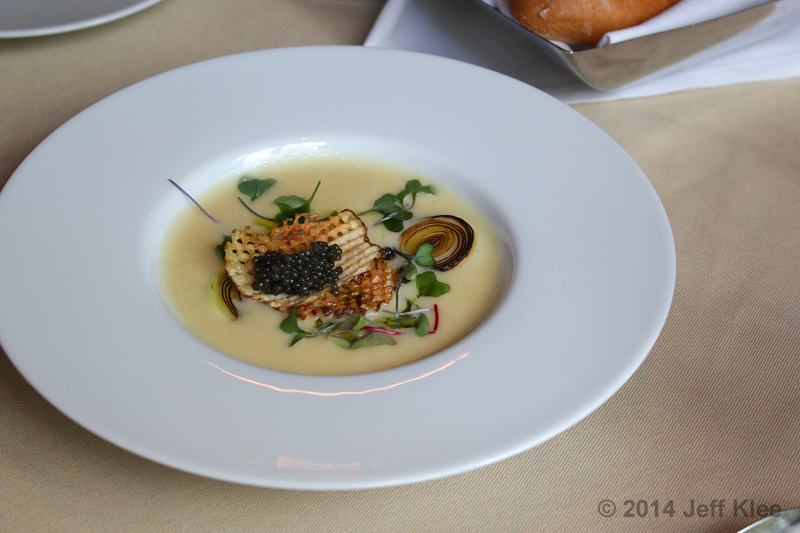 The soup was topped with a potato crisp piled with caviar. The bowl included two whole onion slices that had been pan fried until just browned, and garnished with several sprouts. This soup had a great, rich flavor, and I enjoyed the thicker, bisque-like consistency. I haven’t had this flavor very much in the past, and this was the first I’ve had with sliced onion included. The onion was well cooked so that it was soft and easily broke apart using the soup spoon. It added the perfect addition to the potato and leek flavors already present. Another first was the addition of a potato crisp, adding the only crunchy ingredient. This fried potato of course matched the soup’s original flavor, which can’t be said for the most unusual addition, that of caviar. I thoroughly enjoyed the fishy flavor the caviar brought to the other tastes. The others blended together to create one overall flavor, where the caviar created a contrasting taste that stood out. This gave the soup a pop that while not needed, was interesting. The potato leek soup was the second menu’s replacement for the earlier week’s butternut squash soup. 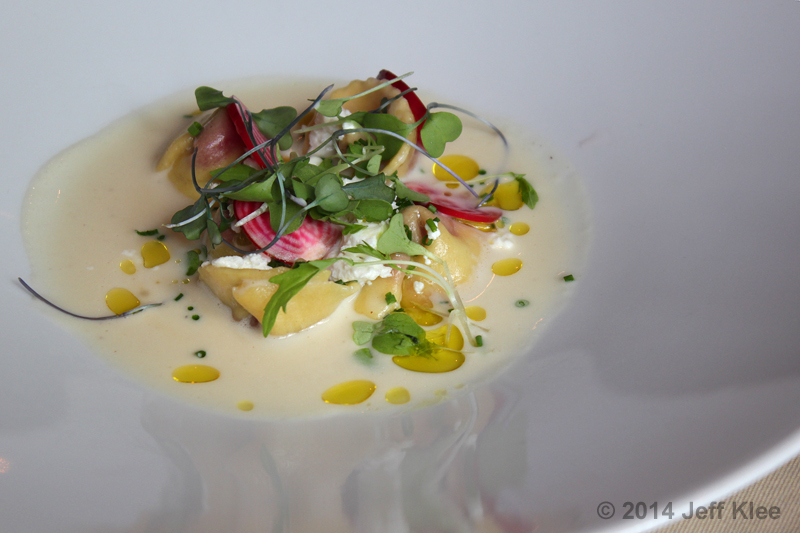 Our third course was a beet and goat cheese tortellini. It was served in a Parmesan nage. The tortellini were filled with puréed beets. With each bite, the sweet filling brought an aromatic burst. Additional beets that had been sliced and boiled for a softer texture were added to the tortellini. To contrast the sweetness, chives generously placed across the plate gave a little zest. There were two different cheese flavors present. 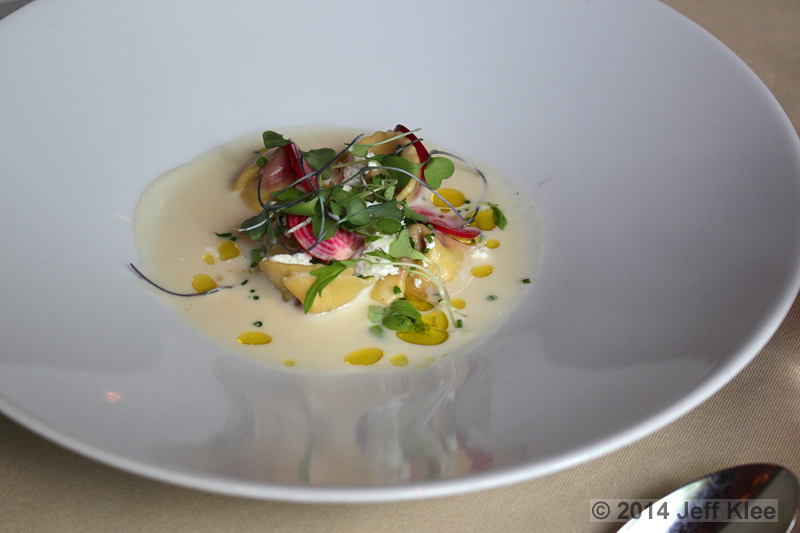 One was the more tart goat cheese that was well sprinkled around the tortellini. 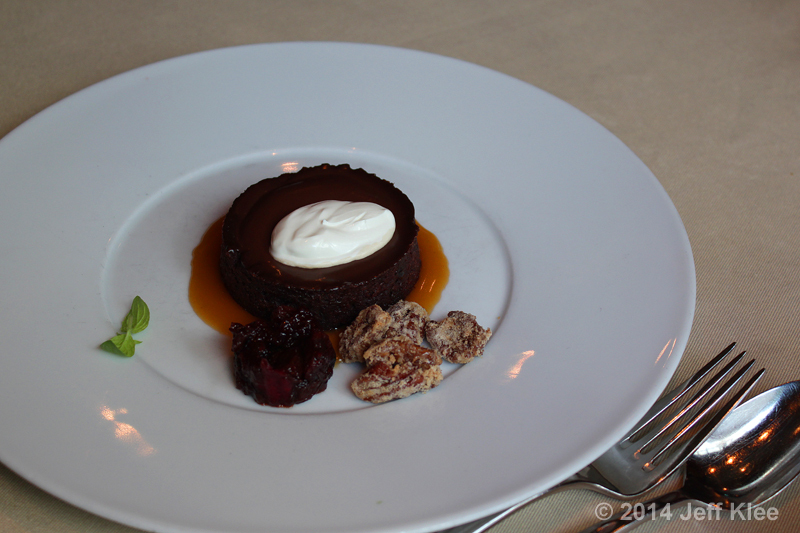 A standout flavor, it was limited enough to not overpower the sweeter taste of the beets. The other was the less peppy Parmesan that was used to create a nage in which the tortellini were swimming. This Parmesan sauce was the ideal choice for a pasta based dish. My wife (who had a gluten-free pasta version) and I both loved this dish. Pasta with Parmesan is a familiar taste, and the addition of the opposing goat cheese and chive flavors stepped it up to the next level of tasty. I liked the uniqueness of something other than meat or cheese inside the pasta. The pasta served in the beginning of the week was a crabmeat raviolini, having more traditional flavors found in this Italian staple. I rate the second run of this course much higher. We moved on to course number four, consisting of grilled tuna with braised Borek Farms turnips, Swiss chard purée, a potato croquette, and red wine reduction. A few distractions had me forgetting to photograph the plate before excitedly digging in. The photos here are not the correct representation of what was presented to us, rather a partially eaten version. The tuna was barely grilled, and we both received a very medium-rare serving of fish. I like all my beef served this way, and if it’s the right meal, some of my fish as well. This was one of those times. The nearly raw fish had a strong flavor, as most tuna does. The texture remained firmer from the lack of cooking, which matched well with the braised turnips that were also left closer to their raw form than is normally seen with braised vegetables. There were two semi-liquids at the base of the plate. The Swiss chard purée was a little confusing to me. It didn’t add any type of strong taste to the dish, and seemed to add color to the plate more than anything else. The other was the red wine reduction, which was a fine compliment to the grilled tuna. The potato croquette seen here is nearly gone, but there wasn’t much more there before I dug in. It was a small, single croquette that to me had a basic potato flavor with little seasoning. Even the breading was barely noticeable, making it essentially a double-bite, mashed potato ball with a few breadcrumbs attached. I didn’t think much of it at the time. If anything added any bite to this course, it was the unmentioned mustard leaves used for garnish. Each time one was eaten, I got a hint of mustard flavor which added the kick need to make the rest of the ingredients go from bland to just okay. The main course was labeled Beef Two Ways. 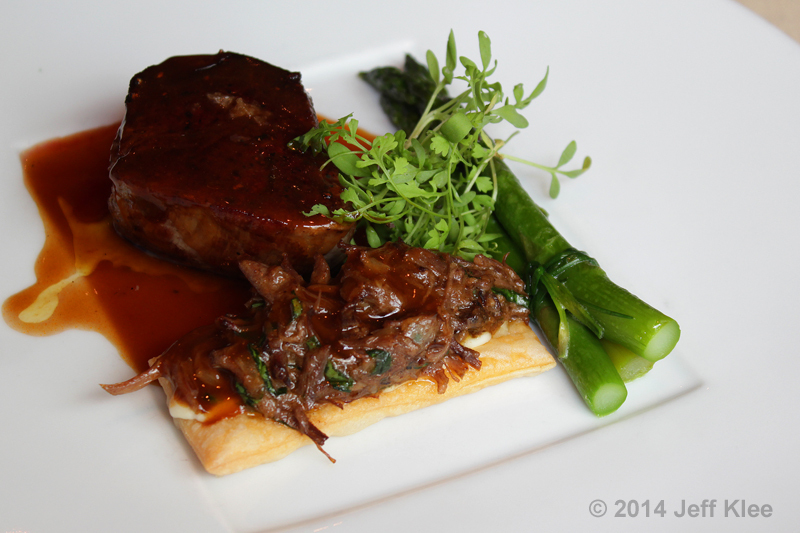 It was a duo of a grilled White Oak Pastures tenderloin and a Harris Ranch short rib. They were served sitting on a galette. 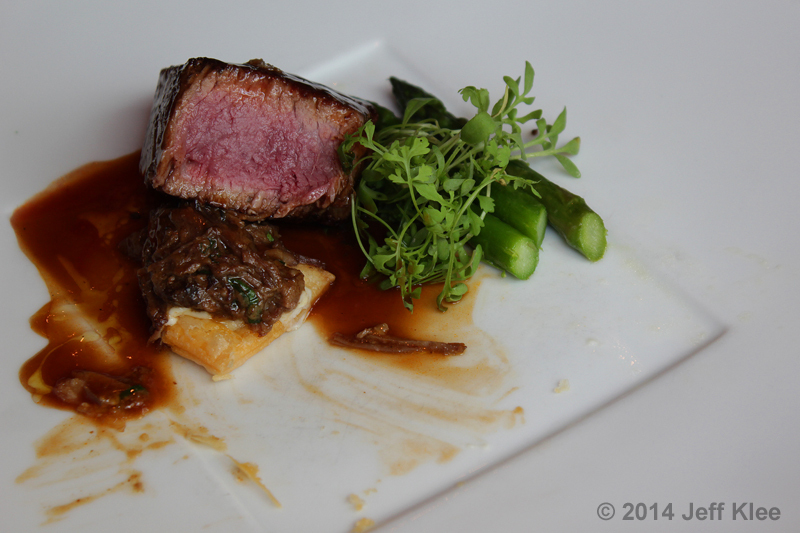 The plate included asparagus, Swank Farms cress, and jus. The meats and cress sat on a galette, which is a puff pastry. I’m a big lover of any pastry served with my dinner meats, and this one didn’t disappoint. It was still flaky despite being covered by a couple juicy meats and their associated jus. There’s something about the “sandwich” feel I get from the bread and meat combo. 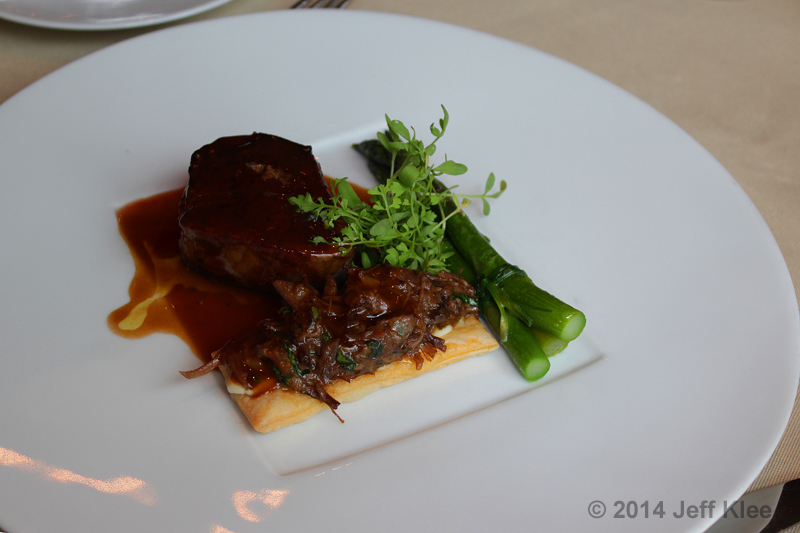 The short rib was of course braised, and was cooked with onion and parsley for more flavor. It wasn’t stated on the menu, but in between the rib and galette was a béchamel sauce. Even though the meat was well braised and fall apart soft, the sauce brought a great creamy texture and buttery flavor to the meat. I expected the tenderloin was going to be served medium-rare, and superbly tender. Sure enough, they delivered. The center was bright red, and practically cut itself as the knife neared. It was well coated in the jus, although I found that eating it with a little cress added a peppery flavor that complimented it as well as any spice. The asparagus was still very crisp. It was most definitely warm, but kept it’s fresh taste while still being easily cut. I didn’t find they went well with any of the other ingredients on the plate, but after being dipped in the jus and adding a little cress to the fork, they were a pleasant side with some good nutrition to boot. Aside from the asparagus, this was one of my favorite courses so far. The meats were oh so tender, very well flavored, and when eaten with a puff pastry they became a dreamy combo that was dinner and dessert in one. Now just because the tenderloin and short rib were “like” a dessert, doesn’t mean I’ll count it as my dessert. Thankfully, we weren’t done. The final course, the real dessert was finally placed in front of us. 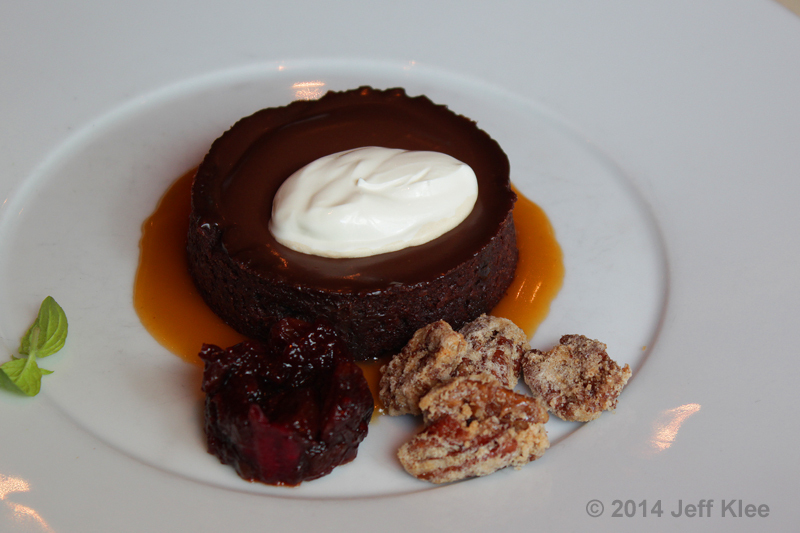 This was a bittersweet chocolate bourbon tart, with cranberry chutney, spiced pecans, and a salted caramel sauce. The tart itself was just a standard, light tasting chocolate. The middle was filled with a bittersweet chocolate that was infused with bourbon. I normally prefer a super sweet ending to my meals, especially with chocolates, which I love to be very rich. While this didn’t satisfy those needs, it was still quite good. The chocolate center had a nice, light bourbon flavor (I’m definitely happy about that as foods with too much alcohol don’t appeal to me). It was warm and mostly liquid, which always helps to make a drier cake product easier to swallow. On top of the liquid center was a dabble of crème fraîche. This increasingly more common topping is quite a treat. It’s basically whipped cream, but much much thicker and more substantial. I love the idea of a chutney with a part cake, part liquid chocolate dessert, but I would have much rather had a cherry as opposed to cranberry flavor. It was only a small portion, but so was the main dessert, so they were proportionate. For the crunchy contrast, we had our spiced pecans. In this case they were spiced with cinnamon and sugar (is there any other spicing that would be expected for dessert?). The whole tart soaks in a small puddle of salted caramel sauce. While not the best dessert I’ve had, it hit all the main perks of a good dessert. Two versions of chocolate. Soft cake, liquid center, and crunchy, sugary pecans. Finally, a sweet fruit for added flavor and crème fraîche for that final creamy topped touch. Unfortunately for me it was the particular flavors that this dessert came with that kept it from being amazing. As I mentioned, I would have preferred a different flavor other than cranberry for the chutney. The liquid center could have been a bit sweeter. 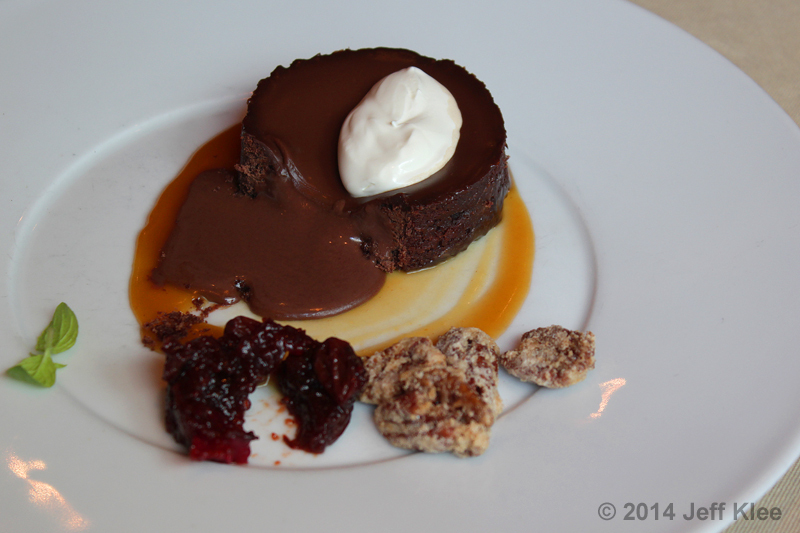 The main cake tort could have been a stronger chocolate flavor, and again, a little sweeter. As a whole though, it was a tasty dessert and something I still would order if it were an option at another dining venue on board. 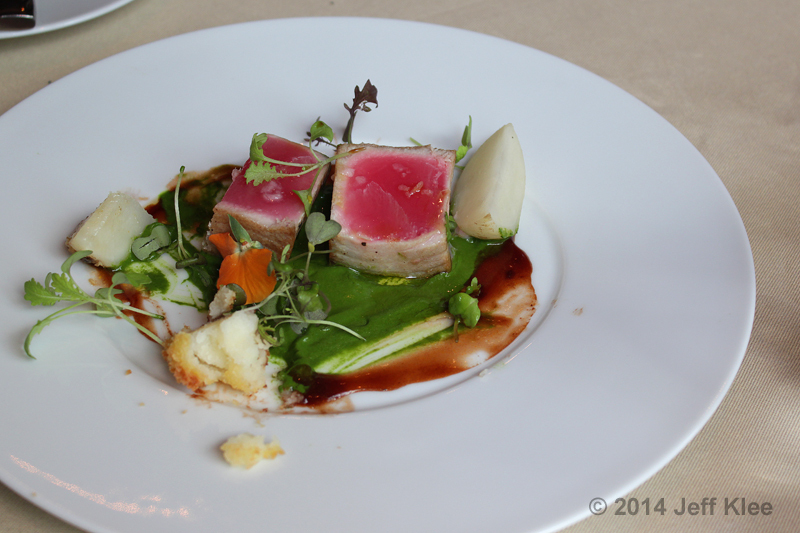 This was my third time eating at 150 Central Park, and each time had been an enjoyable experience. As a lover of all food, I enjoy tasting menus because it eliminates the sometimes tough decision of figuring out what to order. 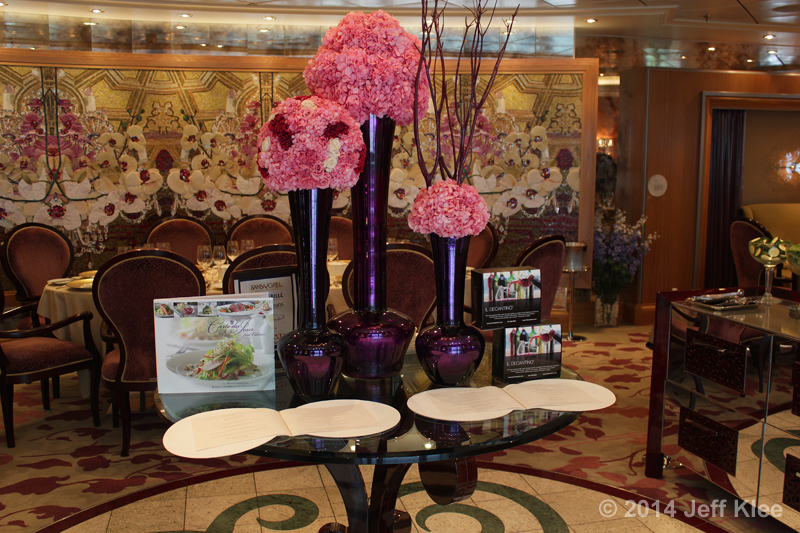 I love the option of having fresh and local foods while on a cruise ship sailing to different locations. The service for me has always been great. It’s perfectly paced, and the servers offer a great explanation of each dish as it’s served. 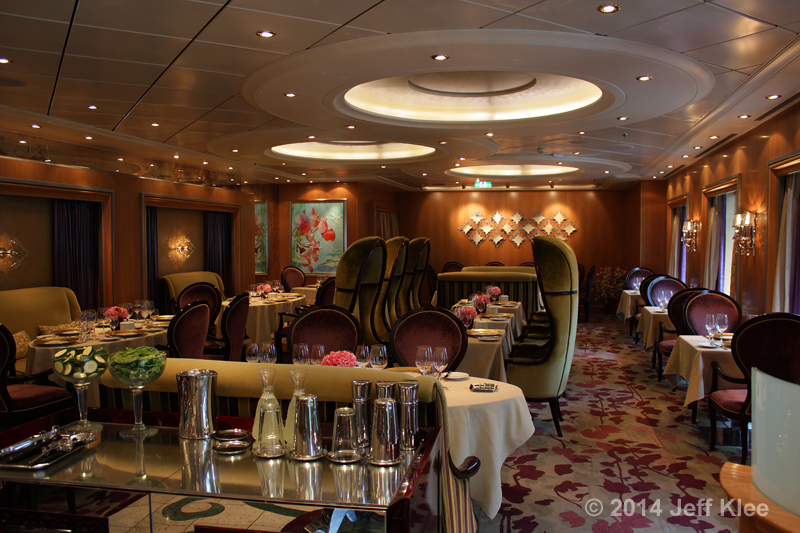 Most of all, I enjoy the fine dining experience, even while at sea. Having a quiet dinner with my family, eating well presented dishes that have unique tastes, all in a restaurant with nice views, and all for a price of a chain restaurant on land. 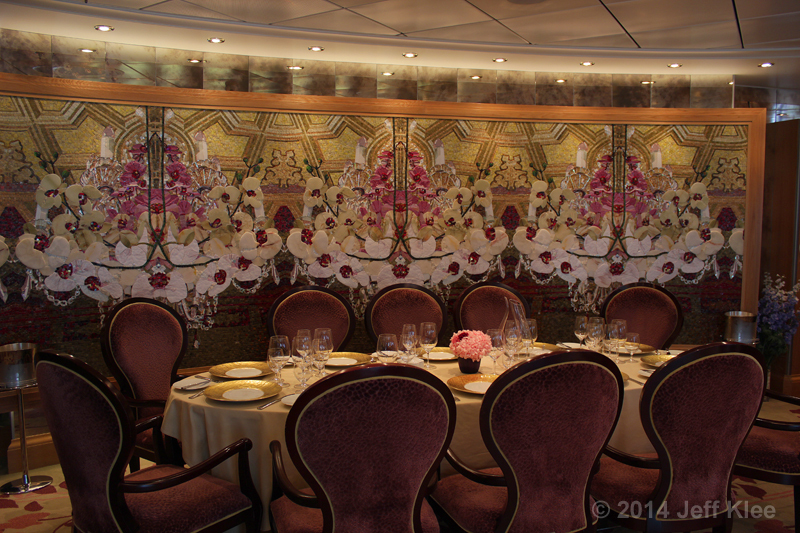 Then I can leave dinner, and do any of the numerous other activities available on board. 150 Central Park is in my opinion one of the best fine dining experiences you can have outside of Chef’s Table. 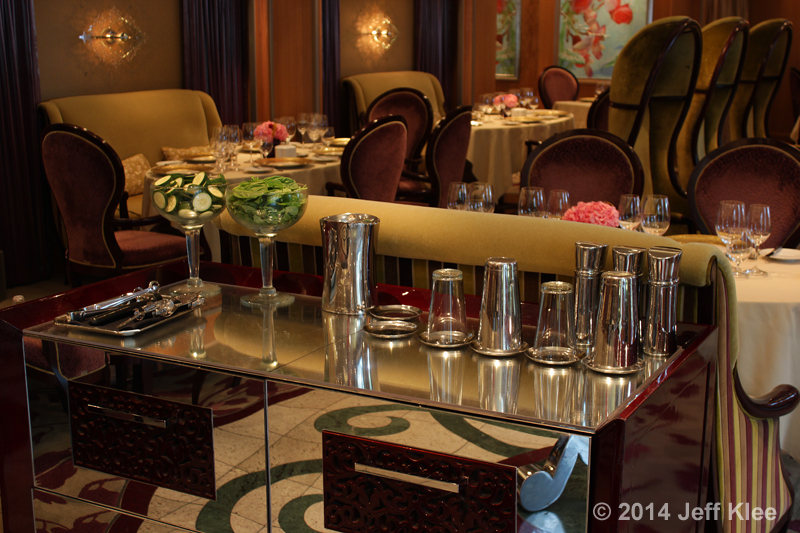 It’s also the only place on Royal’s ships that you can pick up the cucumber martini, a favorite of m any cruisers. It’s a must try venue at least once for everyone.